Too many Americans are not prepared for a financially secure retirement, and both employers and employees bear some responsibility. Employers of low-income workers often don’t provide retirement savings plans, but many workers don’t save enough or even withdraw retirement money prematurely. Workers generally don’t understand the difference between the Roth and regular 401(k)s their employers offer to them. 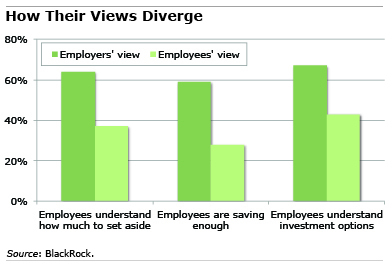 Employers’ adoption of automatic enrollment into retirement savings plans has nudged more people to save. However, following a surge in workers’ 401(k) participation after auto-enrollment was adopted, the trend leveled off. Vanguard Group Inc.’s updated data show that continues to be true (see Figure 21). The more mutual funds a 401(k) plan offers, the more likely employees are to become confused and choose the simplest option, sacrificing investment diversification. Research on 401(k) investment returns shows that the mutual funds offered by employers are fairly unremarkable, though by no means disastrous. The good news is that Target Date Funds (TDFs) attempt to make life easier for employees, even if they don’t always understand how they work. And the use of TDFs, which automatically allocate investments between stocks and bonds based on each employee’s age, keeps growing, according to new Vanguard data (see Figure 68). More states are taking the initiative to introduce retirement savings plans for workers who lack employer coverage. A critical insight for employees is that the younger they are when they start saving for retirement, the less they have to deduct from their weekly paychecks. Click here for a retirement saving calculator created by the Center for Retirement Research at Boston College. Be surprised if it is just under 50% of people that truly understand their investment options. They might think they do, but I would guess it is more likely around 10 to 15% really understand them. My employer, PPD Inc., held ‘lunch and learn’ brown bag lunches to teach employees about their 401k options. I would be surprised if 10 to 15% of plan participant’s understand basic investment concepts (e.g. interest rate risk). Given the historically low bond rates, target date funds “become more conservative” as they approach their target year by gliding from stocks to bonds might be problematic when rates increase. I would be surprised if 10 to 15% of participants knew what the “marginal income tax rate” is conceptually, let alone what theirs was in 2015 (and what they think it will be when they retire). But that information is helpful in making an “informed” decision about traditional or Roth contributions today. I would be surprised if 5% of plan sponsors have established, by age and service cohorts, target asset accumulation goals by which to measure the “success” of their 401(k) plan (e.g. 1X salary by age 30, 2X salary by age 35, 3X salary for 40…10X salary by 67). Or do they just FEEL their participants are doing OK? How are plan sponsors or plan participants suppose to have a reasonable chance to KNOW how much they need to save (and how they should invest) absent some idea regarding what the accumulation at certain ages should be? 401(k) plans are great for employers as they can easily fix their benefits costs to a known (and usually modest) percentage of salary and have zero investment risk. And 401(k) plans have been great for providers, especially those who utilize asset based fees. Where 401(k) plans have been a spectacular failure has been with plan participants who are entirely on their own to figure out what they need to do in order to retire. That shouldn’t surprise anyone given 401(k) plans came into existence entirely by accident. The article stated: “Too many Americans are not prepared for a financially secure retirement…” No kidding. The GAO released a report last year that detailed the current financial status of households between the ages of 55 and 64. Newsflash: 41% of that cohort has NO retirement savings and another 21% have less than $50,000. The median household (that has SOME money in a nest egg (so forget the 41% with zippo)) and is approaching retirement has for a median amount between $10,000 and $20,000. I think most people understand quite well: they are going to get screwed, either by fees or something else if you make a median wage or less. Far and away, the best financial advice you will ever get is: Only vote for political candidates who *promise* zero cuts to Social Security. If possible, only vote for candidates who promise to increase Social Security benefits. This is way, way, way more important then anything you can do with your IRA or 401(k), mainly because Social Security is an inflation adjusted annuity. You *don’t have to worry about running out of money. * Repeat: Any financial advisor will tell you that an inflation adjusted annuity is the gold standard of retirement. My understanding is that, aside from Social Security, inflation-adjusted annuities are not a good buy. Because it is actuarially impossible to predict future inflation, insurers guess on the high side. David Arey is right: the system is broken. The system broke in the 80’s when companies discovered that they could push retirement responsibility onto the employee with a 401(k) plan rather defined benefit pension. Then they discovered cash balance plans that further screwed the rank and file. In the old days, insurance salesmen, not for financial planners, talked about the three legged stool of retirement: Social Security, company retirement plan and personal savings. The company plan all but disappeared and left the poor schlub trying to figure out how to replace the third leg with very confusing 401(k) options. Let’s face it, most workers would not save if they were not forced to do it. It is like life insurance, it has to be sold because no one buys into it on their own. Unfortunately, the world economy is in a crisis of demand, and is dependent on Americans spending more than they can afford (give what they are paid), not saving for retirement, and going into debt. When employer retirement benefits were taken away in the private sector (while being increased in the public sector), employee savings should have been drastically increased to compensate. This would have caused a crisis of demand 30 years ago. Instead, we are facing it now as more and more people reach retirement without savings, and with debt. The reality is, there is basically no way that one can have one or more years in retirement for each year worked at a comparable standard of living without getting it at someone else’s expense, which obviously does not work for everyone. Or by saving a huge percent of income. More than 99 percent of people are prepared to contemplate. Are you perhaps a member of generation that voted for the political party that promised tax cuts when you were of working age, and proposes benefit cuts FOR FUTURE GENERATIONS ONLY right now to pay for them? Younger generations, the oldest of which are now over 50, have been robbed and lied to. Having been lied to, too many did not take the actions required to adjust.